In New Zealand, modifications to rivers and streams over the last hundred years have shown the waters of many catchments can be managed primarily as an economic resource that can be dammed, stored, diverted and extracted for use. Competing uses have resulted in many degraded water systems. This website describes ways in which whanau, hapū and iwi can identify their preferences with respect to the flow regimes that they want to see in streams and rivers. In effect it is a guide to show how they can identify their cultural flow preferences. introduces the process of Cultural Opportunity Mapping, Assessments and Responses (COMAR) as an integrative planning process that enables Manawhenua to inform freshwater management. provides examples of Cultural Flow Preference Studies (CFPS) that were completed in New Zealand catchments. describes the process that a whanau or hapu can follow to plan and implement their own Cultural Flow Preference Study. This includes data collection and data analysis. It then discusses how results can be presented. describes how the results of the Cultural Flow Preference Study can link with other flow assessments being undertaken by scientists and resource managers. This page focuses on one type of assessment - a Cultural Flow Preference Study (CFPS) - that has been applied in a few New Zealand catchments. It describes the process a whanau or hapu can follow to plan and implement their own Cultural Flow Preference Study. This webpage includes descriptions of data collection and data entry. A description of the range of analyses that are undertaken to help whanau identify their preferred flow. This page provides examples of how the results of the Cultural Flow Preference Study have been presented to Manawhenua, stakeholders and agencies. A description of how to link the CFPS with other flow assessments being undertaken using different methods. Conclusions and additional recommendations relating to the planning context within which a CFPS will be undertaken. Here you'll find forms and resources to assist those undertaking a CFPS. Fully engage Manawhenua in every aspect of flow assessment and allocative decision-making. Focus on protecting whole, functioning ecosystems. Define flow needs using a holistic approach. Work collaboratively with inter-disciplinary diverse teams of scientists and other experts to make best use of available knowledge and tools, that can complement the Matauranga held by Manawhenua. Establish a sound hydrologic foundation to support recommended flow regimes. Include vulnerability and risk analyses as elements of flows assessment. Adopt a precautionary approach to flow management. Discuss with Manawhenua the purpose and practicality of applying adaptive management to the implementation of the recommended flow regime. Incorporate flow assessments as an integrated component of integrated water resources management. Formally recognise and embed Manawhenua engagement in flow setting in policy and regulatory frameworks. 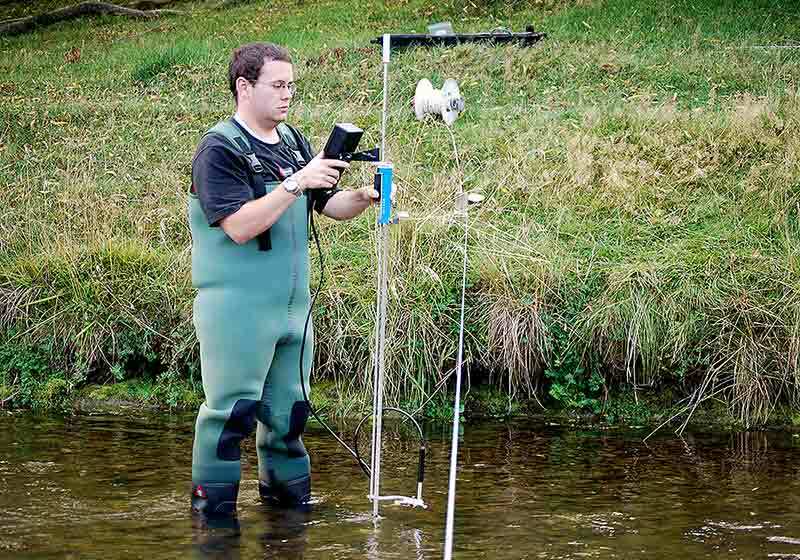 A whanau member who was being trained by a NIWA staff member to measure flows within a river (Neal Blair from the NIWA office in Alexandra is thanked for providing this opportunity). © Cultural Flows by Tipa & Associates. All rights reserved.